Keratoconus is abnormal steeping and bulging of the Corner that takes a conical shape along with thinning and irregularity of its shape and convexity. Cornea is the most front transparent membrane of the eye that is present in front of iris and pupil. Normally it is dome shaped and regular in convexity, so that is focuses the light – along with the lens – regularly onto the retina to get clear vision image. In keratoconus cases, cornea is abnormally steep and it takes conical shape , with outside bulging and thinning, which leads to irregularity of its refractive surface , and so blurring of the light that is going through the eye toward the retina, and hence the image is so cloudy and hazy. The real cause of keratoconus is still not known , but there are some genetic factors that play an important role. 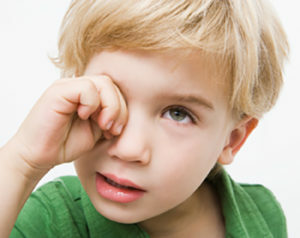 Also the circular itching of the eye may lead to this case. 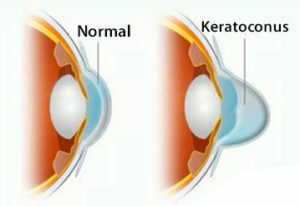 Keratoconus Usually occurs in 10-20 years of age, but sometimes may appear later. Usually it progresses and gets worse with time. That’s why the early diagnosis is very important so as management can be performed a.s.a.p. to stop the progression of the case. To precisely diagnose keratoconus there are some tests and films that are done to show the topography of the cornea as the pentacam and orbscan . These tests are Also important to follow up the case to know if it is still progressing or not. There are many levels of keratoconus regarding the degree of its progression, and each level may have a different kind of management. But generally the management of keratoconus has two main goals : The first is to stop progression of the case, and this is the main step of the treatment, where cross linking of the cornea is performed to harden the cornea by using UV light with Riboflavin that interact and yield more solid conea. So..more bulging of the cornea will be stopped down. The second goal is to improve vision of the patient. This is done either by using rigid contact lenses that help focusing light by a smooth surface, or putting intracorneal rings that decrease the abnormal steeping of the cornea, or by implanting a lens inside the eye that may help focusing the light onto the retina more clearly. In very advanced keratoconus cases, corneal transplantation may be needed to get a good vision. Could you please tell me how check site for google rank ? Which one must be rewrite ?